The Coyotes Fan Express took fans, COX employees and the FOX Sports Arizona girls from the COX Solutions Store in Scottsdale to the Coyotes-Hurricanes game on Saturday. Just as FOX Sports Arizona did during this past Diamondbacks season, the network is once again partnering with COX Communications on the Fan Express initiative. 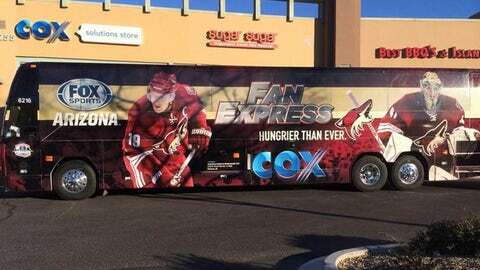 During the 2013-14 Coyotes season, fans are encouraged to visit a COX Solutions Store to register to win a ride on the bus and game tickets for them and a guest. The 50-person bus takes the winners to a Coyotes game at Jobing.com Arena in style, leaving from the COX Solutions Store they registered at and dropping them back at that location following the game. On Saturday night in Scottsdale, fans joined the FOX Sports Arizona Girls and a handful of COX employees for the 60-mile round trip excursion to enjoy the pregame tailgating fun and the Coyotes-Hurricanes game. It wrapped up a busy span for the bus, as in just its first few days on the road, the bus made round-trip drives to Prescott as well as to Kartchner Caverns in southern Arizona and shuttled school kids around Phoenix.